IBM Power Systems disks are still relatively expensive when compared with other platforms. It is therefore good practice to keep track of what is consuming your disk by having the ability to track and be notified if system wide thresholds are breached. For ultimate control, you can use Object Monitor, one of the components within Halcyon’s Level 2 Suite, to not only define these system wide thresholds but also raise alerts based on either the size of the library or the number of objects contained within it. In this example I’m monitoring my Performance Monitor data library QMPGDATA which I know can grow quite quickly. I’m interested in it being larger than 1GB. As the screen shot shows below, you simply select *LIB and enter the library name as QMPGDATA (or explore the libraries on your system and select the appropriate one). As you can see there are options to check if a library exists or not on the system, but now you can also monitor, in this specific example, if the size of the library (*LIBSIZE) is greater than (*GT) 1GB. Alternatively, if you select *OBJCOUNT, you can monitor for the number of objects contained in a library and set a specific number as an appropriate value. You can monitor for values being “equal to”, “not equal to” , “less than or equal to” , “greater than or equal to”, “less than” or greater than”. This is particularly useful if you know that a library should contain an exact number of objects. For example, you may know that a certain library should contain an exact number of customer orders. So you would set up your monitoring criteria so that you would be alerted to this library containing a number less than expected. With regard to the notification method - you have some choices. Alerts can be automatically sent to the Halcyon Enterprise Console, a graphical, color-coded dashboard. You could elect to have them sent as a SMS text message to cell phones, smart phones or tablet devices, (Apple or Android) or sent as an email to nominated accounts or to your helpdesk system. You can also set a full range of automated actions, depending on the alert, including running a command or a sequence of commands. And here’s an example alert for QMPGDATA exceeding 1 GB, in this case being sent to the Halcyon Enterprise Console. 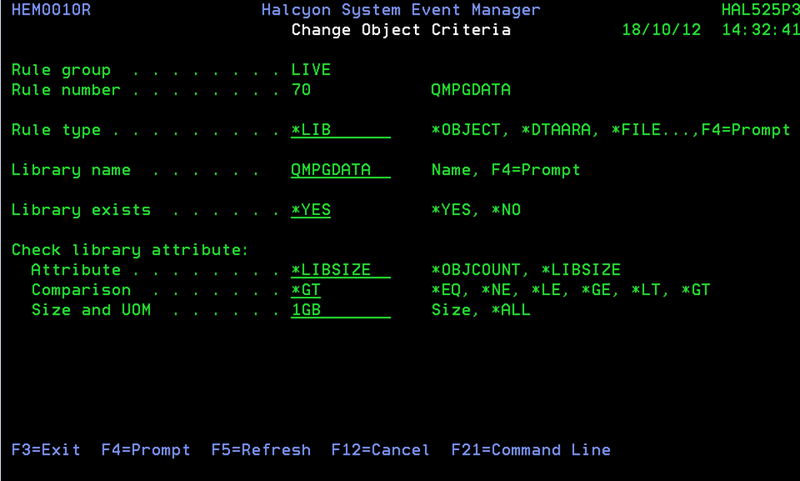 If you wanted to interrogate the QMPGDATA library in order to determine individual object sizes and growth rates you can use Halcyon’s Disk Space Manager Product (which is available as a separate utility or is contained as a module in Halcyon’s Level 3 Suite).